Why Quan 49 - Vietnamese grilled cake is special ? 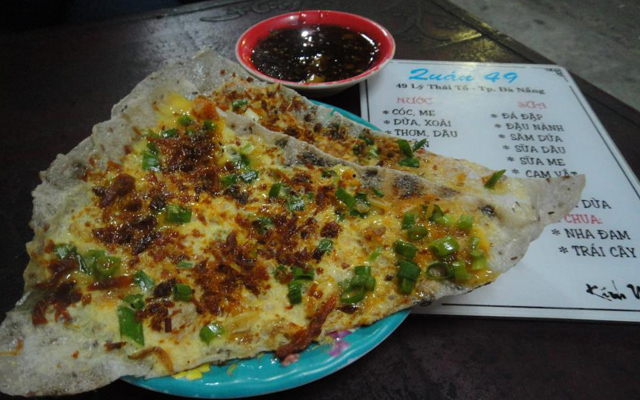 Vietnamese Grilled Cake - Quan 49 is one of the first stores selling "banh trang kep" in Danang. Although it has to compete with lots of new grilled cake shops, this one still attracts young customers by their unique flavour. Located on Ly Thai To Street in Danang city, this small stores provides you different types of ingredients used with grilled cake. However, the signature dish of Quan 49 is "Banh Trang Kep Bo Kho" - Grilled cake with dried beef which is cooked in two ways.